Hey guys, I’m going to be making a router cabinet for my Veritas Router Table Top I picked up on CL. I have 3/4 Birch Ply and was planing on using a single rabbet joint to join the sides to the back and I will Dado a middle shelf and the bottom to the sides. So the rabbets will be in the side panels. My plan was to set up a guide and just use a straight bit. I could have the base of the router ride against the guide or have a bearing on the bit and ride against a guide at the edge of the cut. What do you guys think or what do you do? I’m worried about creating inconsistencies in each panel I cut, if Im setting up a guide each time. Keep in mind…..I don’t have a table saw. Yes I know, I’m going to have a router table before a table saw. Flog me now as you wish. LOL! I actually have no room until I get one garage cleaned up so I can move some stuff out of my little shop to the garage. Plus I have a metal lathe that is taking up space too. But that ain’t going nowhere. Actually typing this is making me think through this a little more. Idea: What if I use a standard rabbet bit that will make the rabbet a tad deeper than the plywood thickness. Then I flush cut the long part of the rabbet sticking out after I assemble? Alright, enough rambling and I’ll let the pros have a word. I think if you have a rabbeting bit with interchangeable bearings—like this—then use that in your handheld router to sneak up on the final depth of the rabbet. I feel that this approach will be slightly better than clamping a guide to the stock and using a straight bit. I have no doubt that a clamped straight edge can yield very accurate results—I just think that there is more opportunity for error in that approach. I would definitely cut the rabbet a little wide and trim it flush to the back with a block plane or a flush trim router bit. I think it is much easier to get a flush fit this way—rather than trying to make the rabbet exactly the right width. 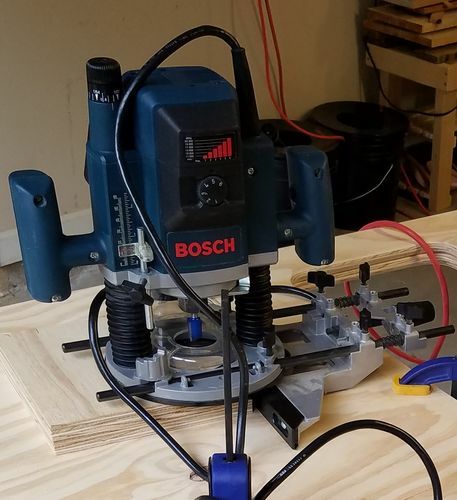 Once you build your router table and fence you can cut the rabbets on the router table. That won’t work on a rabbet. It would work great for a dado though. Have used a Stanley No. 78 rebate plane for rebates in plywood, before. Thanks for the reply and input Bill. I discovered that Eagle America has a rabbit bit with an 11/16 bearing. So I ordered the bit and their entire bearing set for $80. I’m with you on setting a guide up, it’s an opportunity to have variations. JRsgarage, I totally forgot when I bought this Hitachi M12V used it came with an edge guide. Now if I had plywood size straight bits. Ha! I guess I could use a normal straight bit and make 2 passes using the edge guide. That won t work on a rabbet. It would work great for a dado though. Maybe not the traditional way but definitely works well for me, especially on small plywood panels. Keeps me from setting up the dado and fence on TS. Just adjust the bit from fence on guide to cut on edge.